Anyone who has lived in Manhattan (other than you, Donald Trump) is familiar with the concept of the "all-purpose closet". Because closet space (well, space in general, really) is at such a premium, you end up forcing disparate categories of your stuff to cohabitate in closets. In my old apartment, for instance, the sheets and towels lived on the top shelf of a closet that also housed our liquor cabinet, garlic, potatoes, and onions, and our cleaning products. It was a foul and potentially toxic combo, but an unavoidable one. In our new apartment, we are a little better positioned in terms of closet space, but not by much. 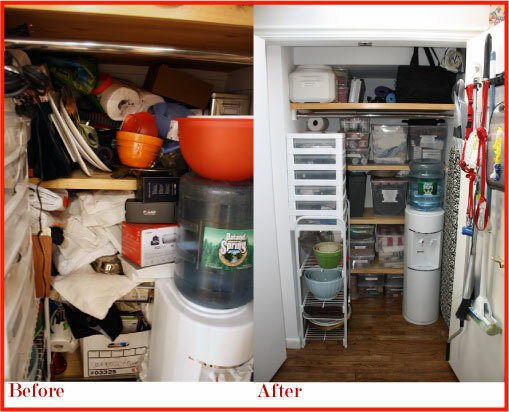 This is particularly the case in my kitchen pantry closet, which, until recently, had become a sort of dumping ground for anything that wasn't clothes in our apartment. This was where paper towels rubbed shoulders with orphaned power cords and an old bundt pan served as a container for batteries and owner's manuals for phones we no longer used. Where sometimes I would go days before changing the empty water cooler bottle because we couldn't find it. Basically, if you can imagine shoving a whole Costco into a closet, this is what it would look like. It was a rugged and lawless place, sort of like the Deadwood of closets. It was impossible to find anything (or even touch anything, really) without setting off an avalanche of junk I didn't even know I had. The last straw was placed on this camel's back the day I realized that I couldn't get the doors to stay closed anymore. I literally could no longer hide my dirty secret from the world, and it was time I do something about it. So, I did what any self-respecting person with a problem closet should do: I grabbed my husband's credit card and zipped over to my own personal mecca, The Container Store. Five hours, two carts, and one serious swipe of the AmEx later (just think of the points, honey! ), I had everything I needed to transform my crazy closet into a haven of fastidiousness and order. Here are the products I ended up using to whip things into shape. Not only can I find and access everything easily, now, but I find I actually have more space, with plenty of room left for whatever falls out the next time I open one of my other closets. 1. Container Store Plastic Bins, $1.50- $10. These bins are super-durable and lightweight and they come in a million shapes and sizes. I used them to sort all my stuff- tablecloths got one, vacuum parts and accessories went into one, and bakeware into another. I used smaller ones for things like cupcake liners, batteries, and taper candles. 2. The Grook Utility hanger, $20, from the Container Store. This hanger attached to the back of the door and holds the mop, broom, duster and pan, as well as smaller things we use all the time, like Skip's leashes. 3. P-Touch label maker, $49, from Staples. I love this thing so much I would let it sleep in the bed with us. 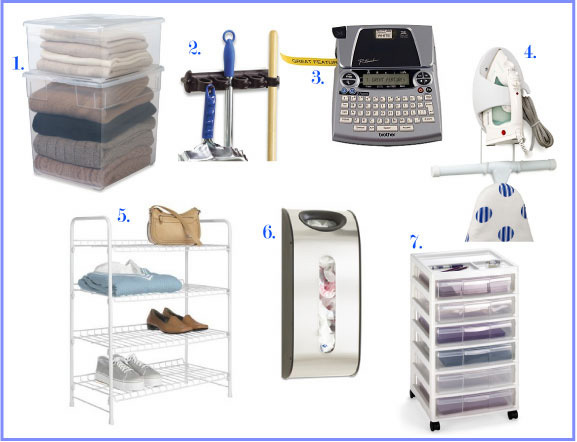 You should seriously get one - all that organizing is only useful if you know where to find everything when you're done. 4. Ironing Board and Iron Hanger, $10, from the Container Store. Gone are the days when the ironing board would open up and fall on me when I opened the closet! No longer will I ever have to listen to my husband say, "Where's the iron?," because he was too afraid to go into the closet himself. Now it's just like at a fancy hotel. Or the Motel 6. 5. Wire shelving unit, $21, from Target. With all that stuff, I needed extra shelf space to keep it organized. I found this inexpensive unit at Target years ago, and finally put it to good use. 6. SimpleHuman grocery bag organizer, $10, from the Container Store. I mounted one of these suckers on the back of the door and it holds a ton of plastic grocery bags. We keep them to reuse, and now we can actually find them. 7. Scrapbook Cart, $59, from the Container Store. We removed the wheels from this thing, and use each one of the plastic compartments to hold all of our electronics and their accouterments. We sorted all the cords, memory cards, manuals, and chargers by type and purpose (and got rid of ones if we didn't know what they did). We call it the Box O' Technology. Wow, good for you! Your closet looks amazing! I must say, I'm coveting your label maker. I'd really like to get one! This unseasonal clean-out might be the most life enhancing accomplishment one has seen during this week of glorious "Currier and Ives" weather. It is at least 6 weeks before the "spring clean out " seasonal writings in the 'zines and its timing is perfect.A daunting task to many of us, your devoted clutter laden fanatics, but timing is all and yours is Dame Maggie Smith perfect. Give It Away Now: Graphic Image Giveaway!